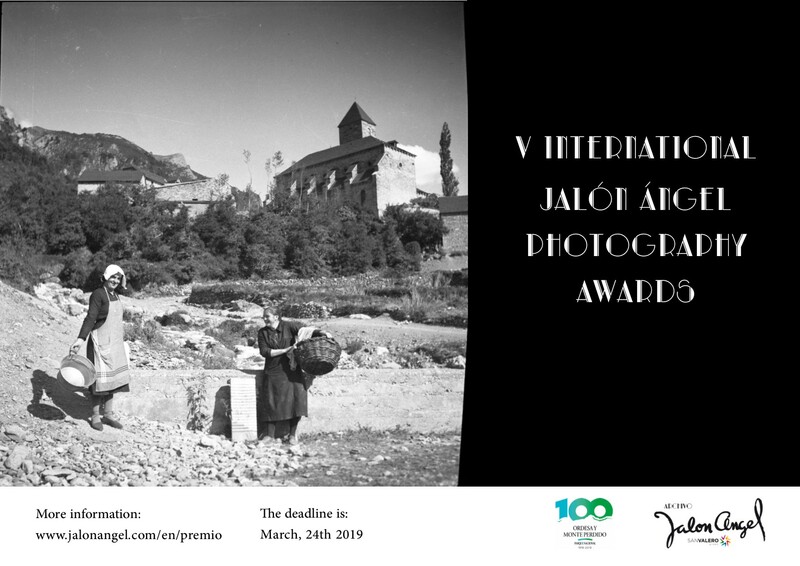 The Jalón Ángel Photographic Archive and San Jorge University (belonging to the San Valero Group) open entries for the International Jalón Ángel Photography Award for the fifth consecutive year. This year, the award will include a special category in honour of the Ordesa y Monte Perdido Natural Park within its centenary celebrations. The admission deadline is 24 March 2019. The 5th International Jalón Ángel Photography Award will therefore consist of three categories this year, with three prizes of €1,000, an emblematic trophy and a diploma: Portrait, Travel and Ordesa y Monte Perdido National Park. In addition, the jury, formed by photographers of recognised national and international prestige, may grant special mentions for each category. This year the jury will include one more member: the head of Service of Natural Spaces of the National Park Council for the special category. Participations must be sent via the website (www.jalonangel.com) and in the following link: http://www.jalonangel.com/en/premio/. The director of the archive, Pilar Irala-Hortal, affirms that "the organisation of the award is something that the Jalón Ángel Archives is very proud of. Year after year national and international participation has grown, which allows us to be in close contact with the latest photographic production and contribute to the international growth of the winning photographers." The terms and conditions can be found in Spanish, French and English. The winners of the competition will be announced on 21 March 2019 exclusively via the website of the Jalón Ángel Archive (http://www.jalonangel.com) and its social networks (Facebook page: Archivo Jalón Ángel and Twitter: @jalon_angel). The archive will only contact the winners directly. The chairman of the San Valero Group and son of the photographer, Ángel García de Jalón Comet, explains that "photography, the promotion of culture and further education, were focal concerns in the life of photographer Jalón Ángel." This year, moreover, the Archive is very excited about the addition of the special category that brings more recognition and relevance to the award. It allows tourists and photographers who have visited or will visit the Park to participate in the competition with their images,” explains the chairman of the San Valero Group and the director of the Archive. This initiative was set up in 2014 as a tribute to the photographer Jalón Ángel (founder of the San Valero Professional School, origin of the San Valero Group) and to mark the 10th anniversary of San Jorge University. Ángel Hilario García de Jalón Hueto has been one of the most outstanding figures in portrait photography in Spain. In 1926, he settled in Zaragoza where he combined his most personal and creative photography, specialising in travel with urban and natural landscapes and his studio portraits.